Department » Financial Services » Programs » 2018 Bond: Our Community. Our Future. Proposition G -- $160 million for transportation infrastructure. You can find more information on the invidiual propositions here. All information related to the 2018 Bond will be added to this webpage. Please continue to check back for regular updates. 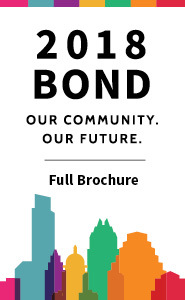 The City of Austin has produced the following 2018 Bond Voter Information booklet and one pager. Acompáñenos a la jornada informativa sobre los #bonos2018 para conocer más sobre ellos. Llame al (512) 974-2000 para información sobre el calendario de reuniones y solicitar servicios de interpretación con al menos 5 días de anticipación. انضم إلينا في الاجتماع المفتوح 2018 bond لمعرفة المزيد عن اتحاد 2018. اتصل برقم (512) 974-2000 لمعرفة برنامج الاجتماع المفتوح وطلب خدمات الترجمة الفورية قبل 5 أيام على الأقل. 2018 bond 오픈하우스에 오셔서 2018년 시 채권(Bond)에 대해 자세히 알아보세요. (512) 974-2000으로 연락하시면 오픈하우스 일정을 안내해드립니다. 통역 서비스가 필요하시면 최소 5일 전까지 요청하세요. Mời quý vị cùng tham dự buổi tọa đàm công khai về trái phiếu #2018 để tìm hiểu thêm về trái phiếu 2018. Gọi (512) 974-2000 để biết lịch trình tổ chức buổi tọa đàm công khai và yêu cầu dịch vụ thông dịch trước ít nhất 5 ngày. District 1: October 10, 6:00-8:00 p.m., Millennium Youth Entertainment Complex, 1156 Hargrave St.
District 8: October 16, 5:30-7:30 p.m., Circle C Community Center, 7817 La Crosse Ave.
You can find a copy of the presentation here. Please use the Presentation Request Form below if you would like to request an additional presentation. The City of Austin is one of multiple taxing entities to which property owners pay taxes annually. The City of Austin property tax rate is composed of two parts: the Operations and Maintenance rate (O&M) and the debt service rate. The debt service rate is set in order to generate the revenue necessary to make the City’s payments for its tax-supported debt. The 2018 fiscal year debt service tax rate is 10.55 cents for every $100 of taxable assessed property value. The 2018 fiscal year O&M tax rate is 33.93 cents for every $100 of taxable assessed property value. The estimated tax bill impact of passage of the propositions and issuance of the proposed bonds and notes contained in this section is an approximation based on the fiscal year 2018 property tax rate (33.93 cents per $100 of taxable assessed value) as well as assumptions about market and economic conditions, and may be subject to change. The numbers provided in the Tax Bill Impact Calculator do not guarantee a certain impact on a property owner’s annual tax bill. 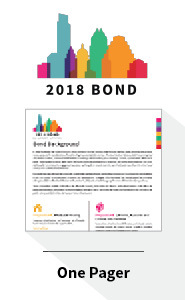 In 2016, the Austin City Council formed a citizen-led Bond Election Advisory Task Force (Task Force) to identify, study, prioritize, and propose various projects for consideration of bond funding in a potential 2018 election. The Bond Election Advisory Task Force, comprised of 13 Austin residents, convened 13 full task force meetings and 66 working group meetings. In total, approximately 140 hours of public meeting time occurred, with nearly 300 Austin residents participating in in-person and online bond-simulator exercises. Additionally, 12 separate community engagement sessions, reaching all 10 council districts, were conducted, and more than 900 online bond surveys were submitted and reviewed. For nearly 24 months, the Task Force met with stakeholders, gathered input, and developed a proposal, focusing its recommendation to the City Council on reinvestment in current city infrastructure. In August 2018, the Austin City Council passed an ordinance calling for a $925 million bond election on November 6, 2018, and set ballot language for seven different propositions. June 28, 2018: City Council passed Resolution 20180628-027 directing the City Manger to bring back an ordinance calling an November 2018 Bond Election for $925 million.